During the wedding planning process I started reading a lot of blogs. Sooooo many brides were doing DIY projects. The wedding blogs really got my planning/artistic juices flowing. I would read about how simple it is to make X all on your own and immediately I would want to take on the DIY project. I would gently remind myself I am not the artist in the family, that would be my sister, the MOH. My friend from work was kind enough to share A LOT and I really mean A LOT of her wedding/party planning expertise with me. One of her suggestions was to check out her friend’s blog called Aisle with Style. As I was browsing the posts I found a post for the wedding invitations my friend had done for her brother’s wedding. When I stumbled upon the blog post I instantly wanted to make my own invitations. I emailed my friend and asked her for the details on the invitations she made for her sister-in-law’s wedding. Then I forwarded the post to my then fiance and mother. Both liked the invitations; however neither was excited about the DIY part. My husband was very concerned about hidden costs of DIY as well as the time it would take us to do the invites. I started pricing out invitations online. The non diy invitations would still cost a pretty penny even from the online vendors I found. While visiting my parents for Thanksgiving we spent sometime doing wedding stuff. Sunday we went with my mom to register at Bloomingdale’s. There just happen to be a paper/invitation store in the same complex so we stopped in to check out the invitation designs as well as pricing. As I had assured both my mother and husband the invitations were expensive! Both were finally, mostly, on board with a little (or a lot as the case maybe be) DIY action. After purchasing the paper and the pretty purple envelopes. I could barely contain my excitement. There was only one issue, I had a super old version of PhotoShop and it wasn’t compatible with a lot of the new functionality. My husband to the rescue! He quickly jumped onto his computer and downloaded a 30 day trial version of the newest PhotoShop version. And then the fun began. YAY! I spent many hours camped out on the couch, watching tv and and cutting our invitations and insert cards down to size. 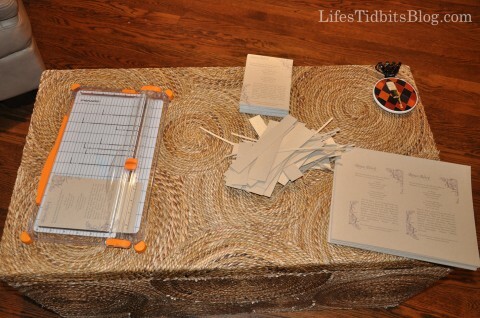 Below is a little picture of how I totally took over the coffee table to create our invitations. In the end we had three pieces to our wedding invitations – the invitations, room block insert card and rsvp post card insert. After completing all the invitation the next step was to do the envelopes. Check out our DIY invitation calligraphy here. We also made custom stamps for our wedding invitations, which you can see here. 1) Buy a paper cutter. A good paper cutter is essential for straight lines and a sharp blade is ideal so the edges don’t fray. 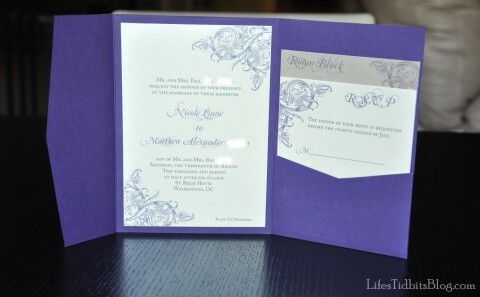 2) Make one complete invitation before printing 100 copies. When I made my inserts I didn’t put it all together until I had printed multiple copies. I think realized the Room Block and RSVP text was way to big and had to reprint. Waste of paper and time. 3) Print High resolution. I printed the 1st few on standard. They looked nice, but when the husband took over the printing press he printed on High (he had no idea what setting I had used) the colors popped more and so we had to re-print the ones I had initially printed. 4) Buy extra paper. I suggest printing on regular white paper for a while until you think it is right. See #2 and #3 I needed extra paper because of small modifications and printer settings. 5) Start early. Everyone laughed when I started my invitations 8 months out. But I wasn’t motivated some days or just plain didn’t have time. Giving myself a lot of time to complete the project reduced my stress level and made it more fun. I love your invitations !! I am thinking of doing the same type of invitation for my wedding. I’m still in the stage of pricing the differences of DIY and buying, the thing is I need around 450-500 invitations. Good thing is the wedding is a year and a half away so i have time to make that many invitions. My question to you is, if you don’t mind me asking,around how much did you spend on making the invitations and what supplier did you order your supplies?